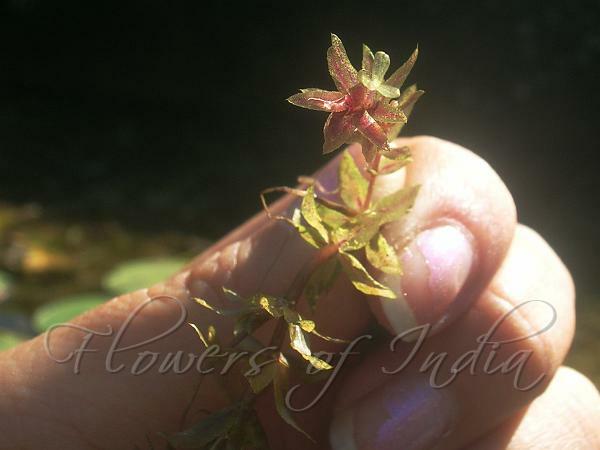 Water Thyme is an aquatic herb native to India and S. Asia, naturalized all over the world. 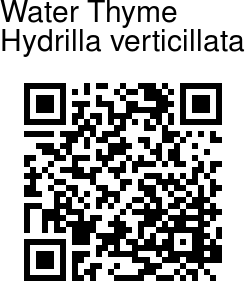 It has off-white to yellowish rhizomes growing in sediments at the water bottom at up to 2 m depth. The stems grow up to 1-2 m long. The leaves are arranged in whorls of 2-8 around the stem, each leaf 0.5-2 cm long and 0.7-2 mm broad, with serrations or small spines along the leaf margins. The leaf midrib is often reddish when fresh. It is monoecious (sometimes dioecious), with male and female flowers produced separately on a single plant. The flowers are small, with three sepals and three petals, the petals 3-5 mm long, transparent with red streaks. It reproduces primarily vegetatively by fragmentation and by rhizomes and turions (overwintering buds), and flowers are rarely seen. Photographed in Manipur & Delhi.